First day of Project Advent. Here we go! Courtney left town today, and won't be home until Monday evening. I don't know how much she wants me to say about this, so I'll just say that she is also embarking on a journey of service, and that it's something I've written about once before. (Hint: Not the puppy...) This leaves me in an interesting spot for the first few days of my project. I'll either have to make sure that I do my hour of service while the kids are in school, or that it's a project that I can involve them in. Every Tuesday, Thursday & Saturday, FUMC provides a free nutritious meal for an average of 150 families and individuals. That’s over 23,000 meals each year! Volunteers prepare, serve, and clean up after the meal. Whether you can help once a week or once a month, the Second Helpings Team welcomes your service. Tuesdays and Thursdays, 12:00 p.m. - 1:00 p.m.; Saturdays, 11:30 a.m. - 12:30 p.m. There's a pretty dedicated group that shows up regularly to run this program, and I walked in a little bit before 11:00 to see everybody busily doing something. A group of kind old ladies was rolling plasticware inside of napkins, along with salt and pepper packets, and then putting rubber bands around the bundle. Why? Because it's cheaper to buy the individual components in bulk than to buy the prepackaged ones like you get at a restaurant, and that's money that can go into food. I introduced myself. "It's a pleasure to put a name with your face! You usually sit near the front at the 8:30 service, with your children, right?" "That's me! I'm the one who usually comes in five to ten minutes late." "Well, I wasn't going to say anything..."
I told them that I just wanted to be a set of hands wherever they need help, so they sat me down with a twenty pound sack of pinto beans. If, like me, you don't buy bulk pintos that much, it may surprise you to find out just how many rocks and other loose pieces there are in a sack. My first job was to sift the beans so that all of the dirt and loose bits shook out, then to pour them out on a table and sort through them by hand and remove any rocks, nasty looking beans, or other debris. 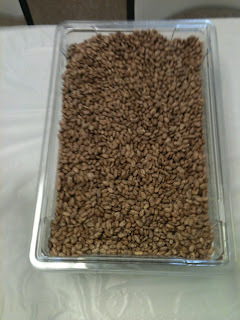 Here is what twenty pounds of hand-sifted pinto beans looks like. You can't really tell from this picture, but that tub is about eight inches deep. I should have taken another picture of all the rocks! ﻿As I sifted, I visited with another volunteer, Dr. Otis Templer, a professor in Texas Tech's Department of Geosciences. When he learned my last name, he asked, "Any relation to Texas Tech's Professor Holwerda?" Yes, he was my dad. "Was?" I filled him in on the events of the last few months. "Well, that's a shame. I enjoyed working with him very much on the occasions when I had a chance to. I thought very highly of him." Hearing that was my reward for service today. I finished sorting the pintos just as a truck from the South Plains Food Bank arrived. I can't say for sure, but I'm going to guess that most of the volunteers at Second Helpings were anywhere from thirty to fifty years older than me, so they were glad to have me here for this part. That's how I spent most of my remaining time there today, unloading the truck and then helping to sort and store the items that had arrived. There's a man who does most of the cooking, and he keeps a running inventory and menu in his head, so he would call out where he wanted certain items stored, and we'd make sure to get them in place. A box full of refill cartridges for a hand sanitizer pump had ruptured and spilled sanitizer over a lot of the shipment. Fortunately, everything that it leaked on was in cans, so the food was safe, but it still needed to be cleaned up a little. I wasn't expecting this when I went, but the volunteers also get to eat before the doors open to start serving. I had to leave soon, but I put a plate together and sat with the others, where I got to see my friend Maxine, who I was in a Bible study with two years ago. She asked how my kids are, and that gave me an excuse to show off a picture from Halloween. Everybody at the table was a grandparent, so that got lots of smiles. I had to leave and return to my office just as the first guests were coming in to have their meals, but I'm planning to come back to Second Helpings at least once more this month, so hopefully I can work the serving line next time. 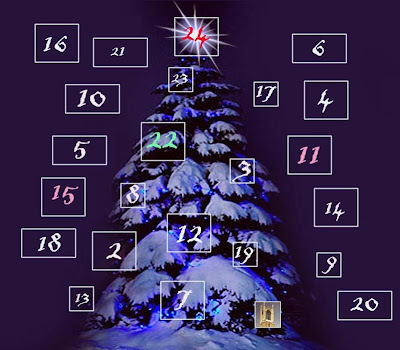 I'm going to open a window on the Advent Calendar each day! That's the belltower at FUMC, in case you wondered why I chose that picture for today's post. Gratitude Project: As I sit in my living room typing this, I can hear wind howling in from the North, bringing ice and cold weather with it. Not everybody has a warm room to stay in tonight, and the wind is an audible reminder of how grateful I am for this house. It's full of people, and it shows the signs of three kids, but it's our home and I'm glad to have it. it is my personal challenge. i will not let you down. Awesome project Danny. You are a witness to so many. Praying that God will bless your efforts. you know. you really cut into my ability to wise crack when you're doing such a great project. so. to this post. and the warm roofs over all our heads and the food in our bellies, i'll say: amen. Thank you, Debbie and Ali. Ali, I have faith in you to rise to the challenge and sass me good before this thing is over. Wonderful, Danny! So nice you met someone who knew your Dad, and spoke so highly of him! Great project!